On this day, we will fire pottey pieces using the raku technique. 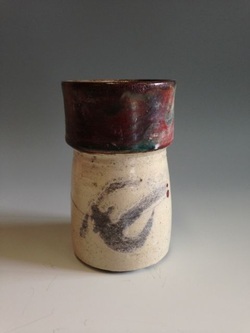 Bisqueware will be glazed with special raku glazes that are available here at the studio. The pots will be quickly fired in a small raku kiln, then put into a reducing atmosphere to release the metallic finish that is characteristic of American raku. The process is fast, unpredictable and guaranteed to delight! People in fall Clay in a Day classes in October and November can plan ahead and make some pieces out of raku clay that will be bisqued before the raku firing. You can bring your own bisque ware, but be sure it can stand the thermal shock of this quick firing technique! Pots made during a fall Clay in a Day class can be fired for free. Fire other pots for $.50/inch, using the largest dimension, with a minimum of $1 per piece.